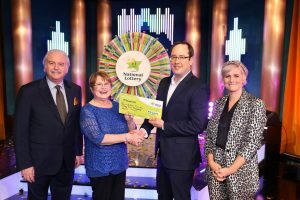 A LOCAL woman has won €32,000 after appearing on the National Lottery Winning Streak game show almost 19 years after she first appeared on the show. Appearing on Winning Streak is a once-in-a-lifetime event for most people but Rosemary O’Brien, from Coill Dubh bucked that trend. In April 2000, Rosemary took to the Winning Streak stage with Mike Murphy to win ￡9,500. Second time round, Rosemary won herself a cool €32,000 in cash from the show. 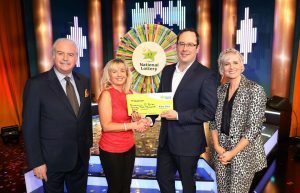 It was all about the Lily Whites on Winning Streak that week as a second Kildare woman, Bernadette Carey from Newbridge, scooped a tidy €55,000 in prizes, a total of €87,000 for the two women. Lucky Rosemary admitted to being speechless after her ticket was pulled out of the drum for the second time. When she was last on the show Rosemary had been married to Packey for two years. Now the couple are together 20 years and have three sons Jamie (17), Josh (14) and Cian (9) who all cheered her on from the RTE audience. There was also great excitement in the family about making the trip to RTE and she was also supported by her three siblings: John, Mag and Sarah, as well as other friends and family members. While most of her supporters came from Kildare, John travelled home all the way from New York with his two children Aine and Suzanne to cheer on Rosemary. John owns a building contractors in Cold Springs, New York called Coill Dubh Contractors so he proudly flies the Kildare flag even though he has been living abroad for many years. Rosemary started work two months ago for industrial security company (which makes security gates and doors for many businesses) Elite Tech Precision, based in Naas. With her winnings from the show, this time Rosemary isn’t sure what she will do but is planning a nice family holiday. Meanwhile the second Kildare woman in the Winning Streak line-up, Bernadette Carey from Newbridge said there is no better way to kick off 2019, the year of the golden wedding anniversary of her wedding to PJ, than to win a few quid on Winning Streak. The couple have four adult children, Richard, Gerard and David and Michelle. Bernadette has seven grandchildren, four whom supported her from the Winning Streak audience. Bernadette’s son David watched on the RTE player from Berlin in Germany where he is based with his wife Tina and their daughter Lucy. The trio were home for Christmas but went back before the New Year. In her spare time Bernadette is a bit of a green fingers and is proud of her garden which is always standing to attention. She is also a choir singer and has been part of the Curragh Choir for the past 10 years. They regularly sing at church and have had a busy Christmas season singing at various masses.